The Buck started the year terribly and it is ending it in the same way. 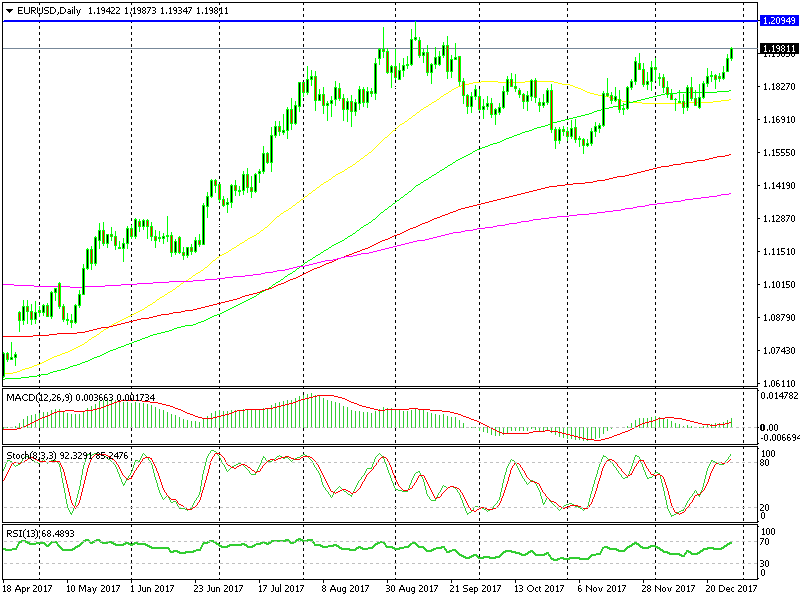 The reverse lower came as a surprise at the beginning of this year, but it proved to be sustainable throughout the year, so now it is not such a big surprise to see the USD close the last days on the back foot or EUR/USD near the top. EUR/USD has pushed more than 100 pips higher this week despite the holiday period. It reached 1.1988 on my forex platform this morning which is one step away from 1.20. I have been thinking for some time about opening a long term sell forex signal around here in this pair. The problem is that we are seeing a relentless push higher at year-end. It is true that cash flows drive the markets around at this time of the year, considering the thin liquidity now. But, this sort of price action looks a bit scary for sellers. The market will return to normal next week, so I’d like to observe the price action for some time before making a decision. The 1.20 level is a big round one and it might as well be the top for this forex pair. But, the price got close to 1.21 earlier this year, so we might see those levels again before turning down. That, together with the price action of the recent days has left me on the sidelines for now. So, I will try to restrain myself today and not open a long term sell forex signal right now. Let’s see what the new year brings for us.